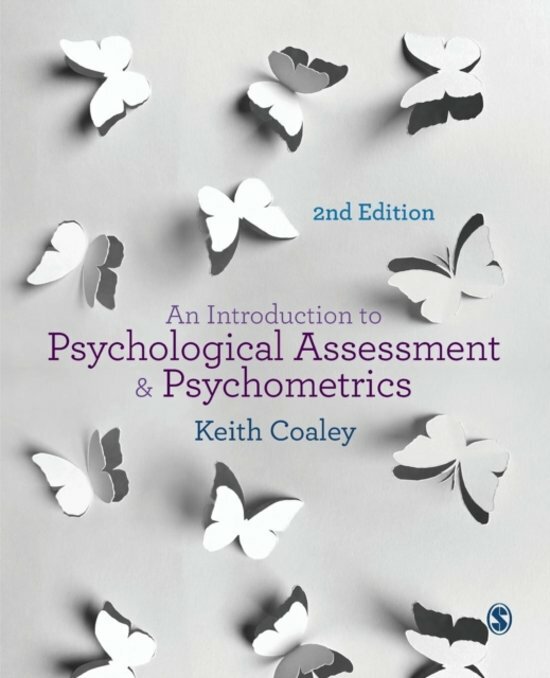 Psychological Assessment in the South African Context This is a summary of the book "Introduction to Psychological Assessment in the South African Context" written by Cheryl Foxcroft and Gert Roodt. I have summarised the majority of the chapters; the ones which are relevant to exams and assessments. Additionally, I have added some extra information and definitions in each chapter. Psychological Assessment Assignment 2 PYC4802 assignment 2 on early childhood assessment and assessment measures. Assignment obtained 82% final mark. PYC4807 EXAM PACK This document contains examination questions and anwsers. PYC4807 ASSIGNMENT 1 AND 2 This document contains assignment 1 and assignment 2. in assignment 2 there is also notes and references that explain the sources for a more broad understanding. I got distinctions for both assignments. PYC4807 Psychological Assessment Assignment 2 (96%) 2018 Did extremely well in this assignment, 96% and I hope it will assist many of you in mastering this subject. PYC4807 - Psychological Assessment: Assignment & Notes Psychometric properties of psychological assessment measures 2x Assignments on the following Topic & Notes: Write an essay on the process you would follow in developing a psychological assessment measure. Discuss the steps that you would take in this process, including how you would choose items for your test, how you would evaluate the reliability and validity of your test, and the issue of establishing norms. Discuss the theory comprehensively and illustrate your understanding with an example or examples.